The Liverpool boss is very happy with the 21-year old’s progress. Emre Can continues to impress his manager. AFTER ONCE AGAIN proving his versatility and quality in Liverpool’s 2-0 win over Burnley on Wednesday, Emre Can has been tipped by manager Brendan Rodgers to develop into a “world-class” player. The 21-year-old started the Premier League victory at Anfield as one of three defenders before moving forward into a right wing-back berth after the break. Can was disrupted by injuries following his move from Bayer Leverkusen in the close-season, but Rodgers believes the German is now finding his feet. “I look at him and I think, ‘you give him another couple of years and he could play in any team in world football’,” the Liverpool boss explained. “That’s how highly I rate him. He plays at the back, is strong, aggressive, fast, serves the ball well. “In midfield, whether it’s central or wide, his football intelligence you can see. He breaks through lines with his power and his pace. “He’s got great composure. I think he’s settling into the game in this country very, very well. “I think you see the response from the crowd – they love him. He does the dirty work as well. He doesn’t just play and look nice, he presses the ball really well. Email “'Emre Can play for any club in the world' - Brendan Rodgers ”. 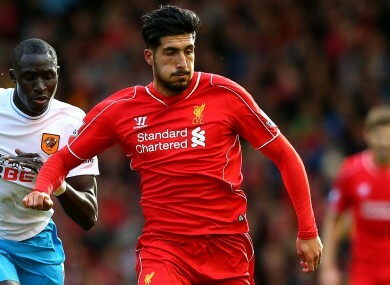 Feedback on “'Emre Can play for any club in the world' - Brendan Rodgers ”.